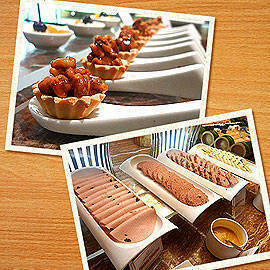 Check out the buffet set to put the 5-star hotel back on Manila’s dining map. The buffet at Cafe Ilang-Ilang is set to put Manila Hotel on the city’s dining map. Click for more photos. Manila Hotel may not immediately come to mind when you’re thinking of your next indulgent meal, but things have certainly changed. The historical hotel which opened in 1912 unveiled its newly-renovated rooms and dining outlets in 2009. Café Ilang-Ilang, the hotel’s main dining outlet, opened its doors just before Christmas last year with a buffet spread promising to be worth the wait. A formal launch has been set to announce its new offerings but the lunch and dinner buffet is already generating buzz, attracting celebrities such as Lucy Torres-Gomez. The restaurant, which seats 300 guests in a more modern space, has live cooking displays and buffet stations with Filipino, Chinese, Japanese, Korean, Italian, and Mediterranean food. The options are dizzying but make sure to leave space for the Peking Duck at the Chinese station, the grilled specialties at the Churrasco counter and the thin-crust pizzas baked fresh from a real wood-fire oven over at the Italian station. 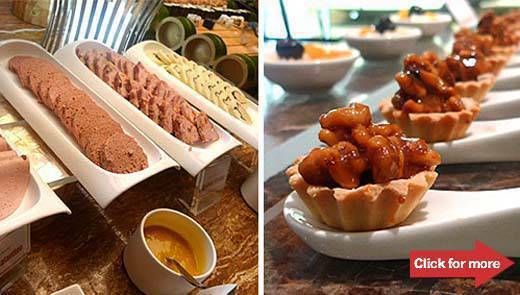 One station also offers "spa food" with healthy eats and the dessert station also offers sugar-free cakes and pastries, which are made to be as satisfying as the other pretty confections on display. Be sure to try out the ice-cream, with flavors like tiramisu, pistachio and Ferrero, which go fast. The Café Ilang-Ilang buffet also has themed nights, where Japanese, Chinese, Filipino, or seafood is highlighted with more dishes on offer. Monday nights highlight Japanese food and Wednesday nights put Chinese food in the spotlight. Filipino heritage dishes on the other hand, are highlighted on Friday evenings, Saturday and Sunday lunch. Expect to spend P1,372.77 net for the lunch buffet from Mondays-Thursdays, P1,647.32 net for the lunch buffet from Fridays to Saturdays; P1,647.32 for the dinner buffet on Mondays and Wednesdays; P1,482.59 net for the dinner buffet on Tuesdays, Thursdays, Saturdays and Sundays; and P1,976.79 net for the dinner buffet on Fridays.